The Orange Order is a multi-cultural worldwide Protestant fraternity that exists to protect and promote the Reformed Faith whilst upholding the memory of King William III of Great Britain of pious and immortal memory. Prince William of Orange, (later to become King William III) fought for the deliverance of the people of the British Isles from tyrannical oppression imposed by the Roman Catholic Church through previous Roman Catholic Monarchs of Britain. King William III was invited to Britain with the aim of instigating the Glorious Revolution that brought about a fairer society and that we as Orange Men and Orange Women now hold dear. The Orange Order has a worldwide membership attracting members from many different ethnic backgrounds but who all share the same beliefs and principles. Orange Lodges exist around the world in England, Wales, Scotland, Northern Ireland, the Republic of Ireland, Australia, New Zealand, Togo, Ghana, Nigeria, Canada and the USA. The first ever 'Orange Association' was formed in Torbay in 1688, just before the landing of Prince William of Orange. Many local and informal Orange groups existed around the British Isles throughout the 18th Century. The Orange Order was formed in Manchester in 1801, and was reformed in the 1850's from a number of different Orange organisations. The Orange Order as we know it today in England was formed in 1876 with the amalgamation of The Grand Protestant Association of Loyal Orangemen of England and the Orange Institution of Great Britain. Orange Associations have held Orange Parades in local cities and towns in the North West of England for over 200 years. The Orange Institution is one of the oldest organisations to be in constant existence in Manchester - testament to the timeless principles that we stand for. The Orange Order is a worldwide multi-cultural Protestant fraternity with staunch beliefs based on the Reformation principles and truths of the Open Bible. We welcome new members from all ethnic backgrounds who belong to the Reformed Faith and support the British Monarchy and constitution. 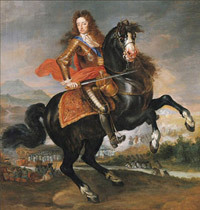 The Orange Order commemorates William Prince of Orange, the Dutch prince who became King of England, Scotland, and Ireland as a result of The Glorious Revolution of 1688. King William III ended a violent period of religious intolerance promulgated by Roman Catholic monarchs and brought positive lasting wide scale reform to the British society. These reforms included The Bill of Rights and The Act of Settlement both of which are at the centre of British society to this day. The Orange Order in England is structured in a pyramid hierarchy, with governing The Grand Lodge of England at the top, followed by Orange Provinces, Orange Districts and finally individual Orange Lodges. Orange Lodges meet in community and church halls each month and sit in ancient form. Members of the Orange Order come from all walks of life. The organisation has historically drawn its membership from all classes of society, both in the United Kingdom and worldwide. The Orange Institution is an inclusive organisation made up from members of many races, with African and Native American members celebrating our shared Protestant Orange heritage. The Orange Order is probably best known because of the traditional public processions of witness or Orange Parades through town and city centres. We hold Orange Parades to give public witness to our Faith. 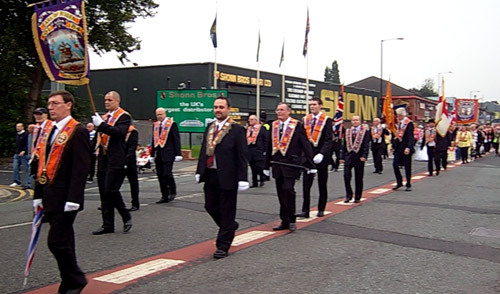 Orange Order Parades consist of marching bands playing traditional Orange music and Christian Hymns followed by Orangemen walking in lodge form with regalia and ceremonial artefact’s. Members of the Orange Order take part in public processions throughout the United Kingdom, including an annual parade through Manchester City Centre. Members of Lodges will often travel to support parades organised by other Orange Lodges throughout England, Scotland, Northern Ireland and sometimes further afield. Orange Lodges raise money collectively and individually for charity each year and we are increasingly becoming engaged in outreach work to support local communities. There is an Orange Order parade through central Manchester each September. We are more than happy to forward membership enquiries to Lodges in all areas of the country. Meet on the third Sunday each month in Manchester City Centre. Meet on the fourth Thursday each month in Stockport. This section is currently being updated. Please check back soon.